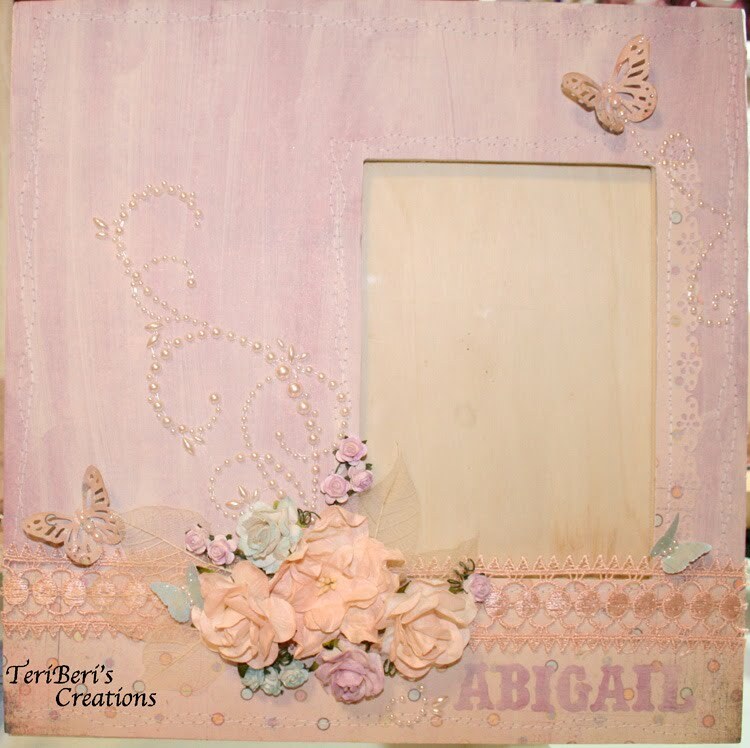 TeriBeri's Creations: "ABIGAIL" (BABY PICTURE FRAME"
Just a quick post today with a new altered frame. One of the girls that works in another office on our floor is having a baby, so today we are all giving her a lunch/baby shower. I started getting the flowers together, pulling the paper and before I knew it, I was done with the frame. I used the Basic Grey Kioshi paper to cover the frame, painted it with a mix of antique white acrylic paint and water to give it the white wash look. The flowers are ALL from iamroses.com - I am in love with these flowers. I buy them in white so that I can alter them to match my project. 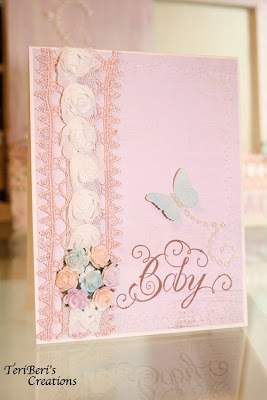 The flowers are altered using the Lindy's Stamp Gang Starburst Sprays in Ramblin Rose Pink; Magnolia Magenta Gold and Baby Azure Sea Asters misted very lightly. I also spayed the entire background paper with the Ramblin Rose Pink after I white washed it. 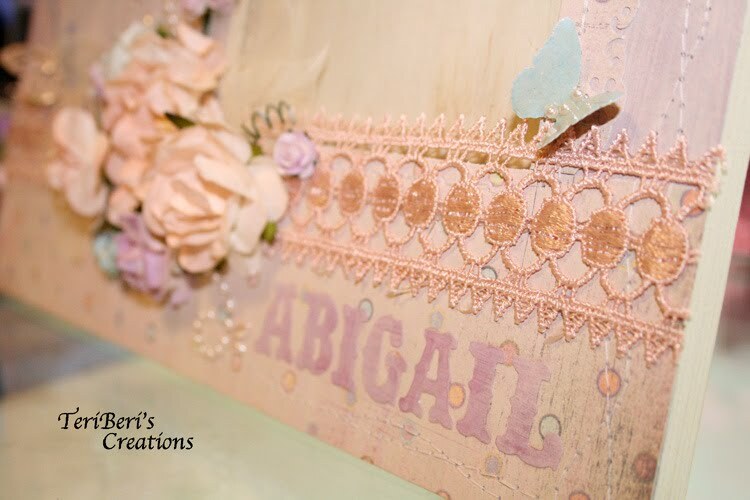 I used the scrap from the frame section to cut out the baby's name "ABIGAIL" using the Tim Holtz Vintage Alphabet Die. Other Supplies: Websters Pages Lace; Martha Stewart Butterfly punches; Martha Stewart Lace border punch; glossy accents, Prima Say it in Pearls, Misc Sewing. More altered frames to come.....hopefully this weekend I will make 3 frames for some very special friends. I just LOVE altering them. 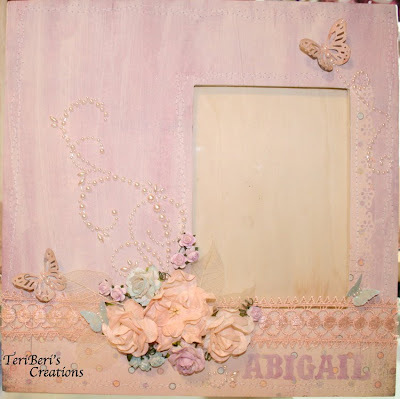 I also have to keep working on the ones for the teachers so you will be seeing lots of altered frames using new paper lines from GENERATIONS CRAFTING. I love it!!!! Beautiful work. I want to be as talented as you when I grow up! LOL! Gorgeous! I believe your friend is going to absolutely love both of these projects! Have a happy weekend and I can't wait to see the rest of your frames! Just BEAUTIFUL girlie! She will fall in love with it the minute she sees it! What a grand gift for a grand occasion! I love it! HUGS! Wow! 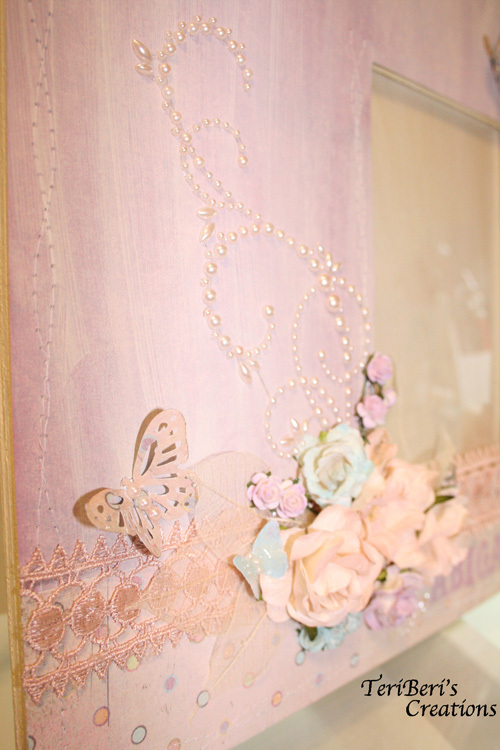 That frame and card is just beautiful!! Oh Teri...please tell me what she said when she opened her gift. It's gorgeous! The colors are so beautiful. 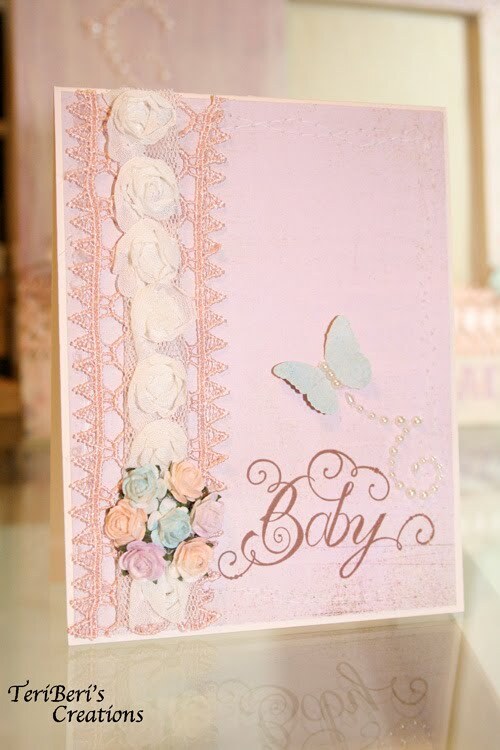 The card is gorgeous too. 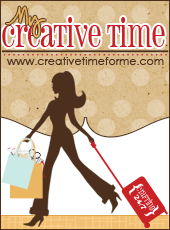 Hope you have a great weekend crafting! Beautiful frame. 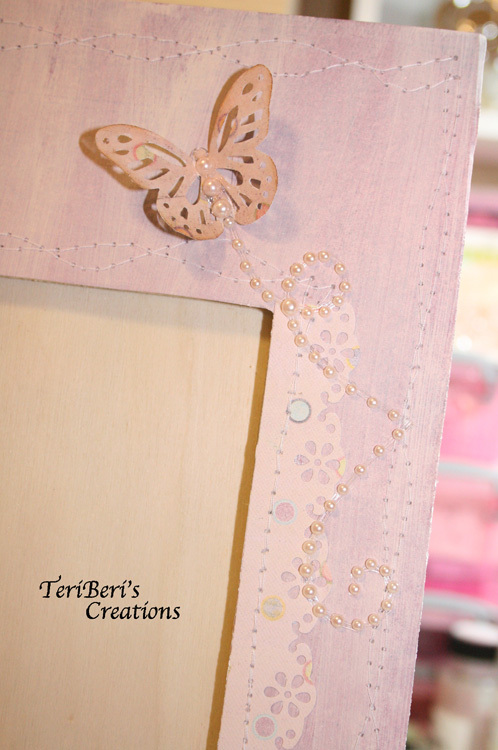 I am sure she loved the frame and the card. She is one lucky mom. 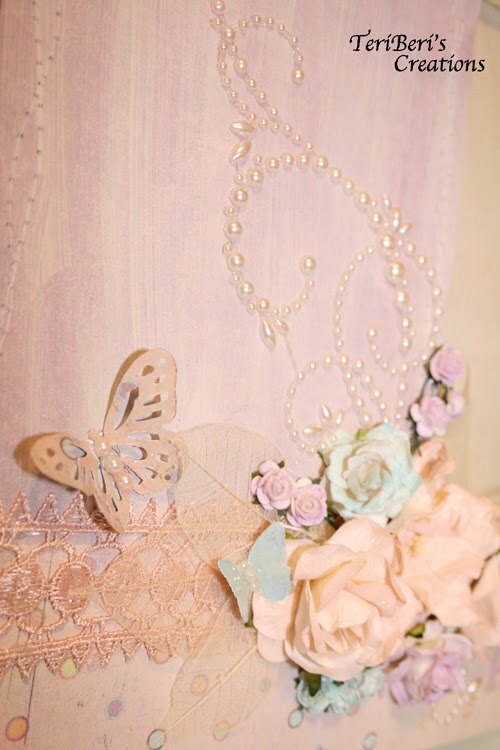 Just gorgeous Teri, love the soft shades of pink and the lace. Love the card too.